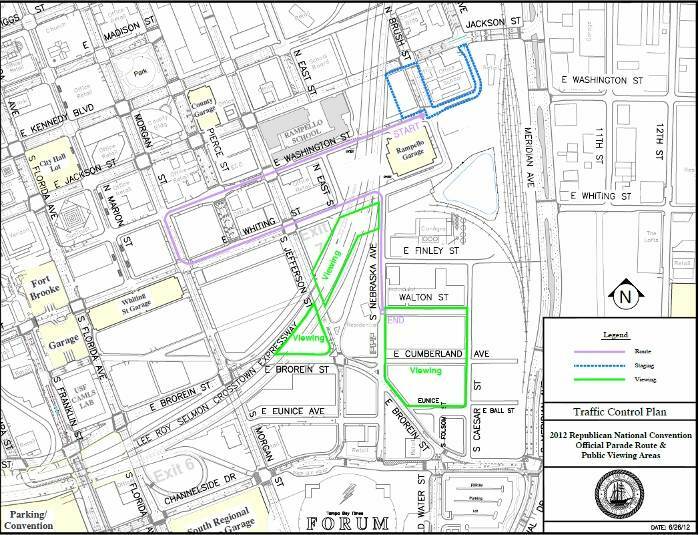 TAMPA, Florida -- The City of Tampa announced the official parade route and public viewing areas for demonstrations during the Republican National Convention. The official parade route runs down Washington Street, turning south at Morgan Street, east on Whiting Street and then south along S. Nebraska Avenue. 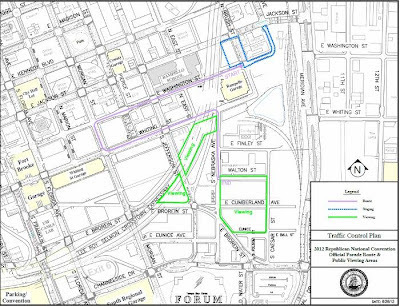 The goal of the parade route is to minimize disruption to traffic in downtown while providing space for demonstrations. However, groups may hold demonstrations and march in other public areas, such as sidewalks in downtown. There will be two public viewing areas available that are linked by S. Nebraska Avenue. There is viewing area under the Leroy Selmon Crosstown Expressway along Jefferson Street and one available along S. Nebraska Avenue up to Brorein Street. In total, the public viewing areas equate to over seven acres. Comparatively, the public viewing area in Denver equaled just over one acre, and the area in Minneapolis equaled to about four acres. The public viewing area is where protestors can be within sight and sound of the Republican national Convention, which will be at the Tampa Bay Times Forum. Along S. Nebraska Avenue and Walton Street, the City of Tampa will provide a stage as well as a sound system for participants. In order to provide the space for the public viewing areas, the City of Tampa has leased several parking lots. The lots under the Leroy Selmon Crosstown Expressway along Jefferson Street have already been leased and approved by Tampa City Council. The agreements for the lots along S. Nebraska Avenue and E. Cumberland Avenue will go before City Council for approval. The leases will cost $57,500, and the City of Tampa expects to be reimbursed by the Department of Justice security grant.